I was initially drawn to this book because of the cover and I liked the idea of Vikings. Eelyn's perspective in the beginning comes through vividly as she battles with the Riki and I could sense her inner turmoil about seeing her brother fighting alongside the enemy. She at first thinks she couldn't possibly have seen him because she was there the day he died and saw his body. They leave the bodies on the battlefield in this story because of their beliefs but Eelyn has her own guilt that she's lived with for the past five years. The next day she sees her brother again and happens to get captured. This is when the pace of the story slows down and it's becomes more of a day-to-day thing with Eelyn having to come to terms with her anger and the revelation that her brother betrayed them. She's very observant and she comes to realize much about herself, the war and her enemy. One of her captors, Fiske, sees her brother as his family and though that infuriates her more, she tries to understand the bond that kept him from coming home. Now, not much happens action wise throughout all this but it picks back up towards the end with more bloody scenes. I think the author did a good job setting the scene for these sequences because I found it easy to visualize what was going on in these moments. What I liked about this book was the romance. The passion was slow and I liked that it wasn't an instant romance and they were able to learn about each other, even though they felt this pull. I liked Eelyn's fierceness but she also has a softness to her that's endearing. Fiske comes off as a tough character but there is more to him as well. I liked his little brother, he's such a cute character thrown into a world of blood and war. There are other characters that aren't as fleshed out but are apart of changes in Eelyn internally and externally. Overall, the writing is steady. 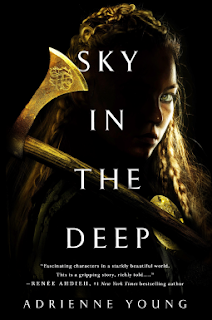 The characters are okay, though some needed more development but I think anyone that likes fantasy and wants to read about Vikings may like this one. Probably not the book for me, but I'm glad you enjoyed it. Great review! Great review! I know it wasn't the best, but glad you enjoyed it. Here's hoping the next read is A+! The cover is amazing! I usually do not check the upcoming books but I think I will mark this one on my calendar! Plus I like the lack of insta-romance. The cover is so catching. I just love it. I like that the romance wasn't the primary focus. It was my first young adult one, I know for sure. I'm sorry to hear you had some issues with it but it still sounds like a pretty solid read. I'm hoping to get to it next week so we'll see if it's a good fit for me or not. Thanks for sharing your thoughts on it! I hope you enjoy it. I did like the story and it's a good read. I haven't read any Viking related book, I'll check this out! Great, I hope you like it. This sounds really interesting. I've never read anything with Vikings before. Great review! Me either and it was a nice surprise. It wasn't all violence and action. I definitely agree about the romance, Cricket! I loved the slow-burn development, and it definitely felt genuine to me. The action towards the end was amazing as well. Lovely review! The action was really good for this one. I think the romance drew me in more. I LOVED Sky in the Deep. I'm sorry it hit the mark for you a bit when it came to character development. Yeah, I liked it but some characters weren't memorable. Great review, I heard amazing raving reviews about this book and now after reading your review I really want to check it out. Plus I absolutely love Viking books, thank you so much for sharing your awesome post.